Geoff Johns JUSTICE SOCIETY of AMERICA #9 1:10 Variant Cover (DC, 2007)! 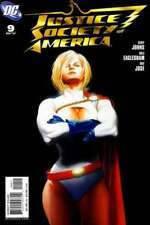 1 product rating - Geoff Johns JUSTICE SOCIETY of AMERICA #9 1:10 Variant Cover (DC, 2007)! Justice Society of America 2007 #4 #8 #9 #11 #14 Sharp NO STOCK PHOTOS! Justice Society of America (JSA) #1-26 + SPEC & ANN (DC 2007) FULL SET LOT RUN! JUSTICE SOCIETY OF AMERICA # 16 * 2007 Series * NEAR MINT! This page was last updated: 25-Apr 09:53. Number of bids and bid amounts may be slightly out of date. See each listing for international shipping options and costs.